Think "Dodgeball" meets "Hunger Games" and you have the right idea. 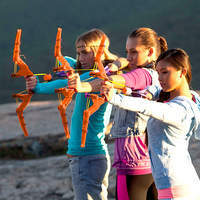 Players are armed with a low power bow that fires sponge tipped arrows in a game of speed, dexterity, accuracy and fun! There is no minimum age, it really depends on the individual child and whether they can effectively handle the equipment. 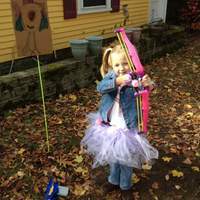 The bows are designed so that arm guards are not needed, but injury can occur if they are used incorrectly, so long sleeves are recommended and arm guards are available. 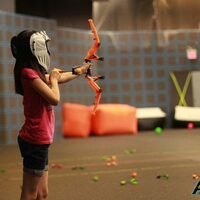 Soft Archery can be played indoors or outside depending on the weather or your preference, and only needs an area about the size of a tennis court or school gym. Each session includes instruction, target practice, and a number of games. 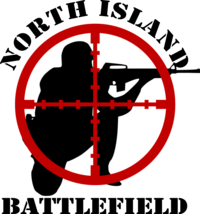 It can also be set up as a target shooting game rather than a combat game, so it could be a booth at a school fair for example. All players must wear a face mask and arm guard at all times. Players must respect the "buffer zone" between the teams. Waivers must be completed for all participants (see Waiver page).